What's up with Rivers Cuomo's hair? The first thing you'll notice is the hair. You can't get past it. 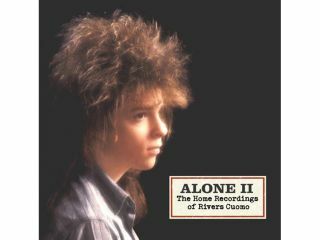 On the cover of the upcoming Alone II: The Home Recordings Of Rivers Cuomo, Weezer's main man shows off the kind of shag that harkens back to the days of hair metal. That's because it was taken during the days of hair metal. "For some reason, I missed the photo session in my high school for my senior portrait," Cuomo says in an interview with Pitchfork. "So I had to go to a photo studio in Willimantic, Connecticut. I didn't really have any ideas: the guy just did his thing. And this is what he came up with. But it's from the same session as my high school picture. "This was my look in high school. I was, you know, somewhat famous - or infamous - in my town for looking like this"
While the hair farmer cover image of Rivers Cuomo is enough to make Alone II (due out 24 and 25 November) a must-have for Weezer fans, the music (recorded during 1992 - 2007) is the real attraction. The 19-song set of demos finds Cuomo doing a Weezer-ized cover of The Beach Boys' Don't Worry Baby and collaborating with Jermaine Dupri on a number called Can't Stop Partying. As an added bonus, there's three tracks from the famously unreleased Weezer album Songs From The Black Hole. "I was really surprised when I put Alone II together and listened down to it," says Cuomo. "I was really surprised how great it was. It makes me wonder if I have more good stuff on my hard drive than I thought I did. This one is not a step down in any sense." Not with hair like that it isn't. Curious as to how Alone II sounds? Give a listen to I Want To Take You Home Tonight, a mid-tempo, power chord winner that rocks the sure-shot. We're sold.